The church: St James Cathedral, Seattle, Washington, USA. Denomination: Roman Catholic, Archdiocese of Seattle. The building: The cathedral was begun in 1905 and was dedicated in 1907. It is in the 14th century Italian Renaissance style, and is recognizable from downtown by its large twin towers. The great bronze west doors are the work of the German artist Ulrich Henn, whose only other commission in the United States is the bronze gates of the Washington National Cathedral. A major remodeling took place in 1994, which brought the altar to the center of the cathedral and added a skylight. Nave seating faces the altar from both directions. Beneath the altar are enshrined the remains of St Frances Cabrini, founder of the Missionary Sisters of the Sacred Heart of Jesus. The church: They run a wide array of ministries and have a real sense of mission for their outreach to those in need in the neighborhood and the city. 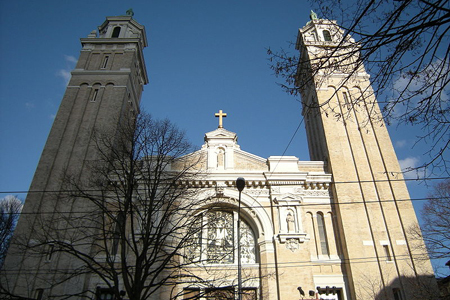 The neighborhood: The cathedral is located in the First Hill district, so named because as one travels east from downtown, this is the first hill one encounters. The area is primarily residential, but is also home to Seattle University and several hospitals (due to which it is sometimes called Pill Hill). O'Dea High School is just across the street from the cathedral, along with a number of other buildings that are part of the diocese. The cast: The Revd Michael G. Ryan, pastor. The date & time: Sunday, March 22, 2009, 10.00am. It started out mostly full, but after the first ten minutes, as latecomers came in, the pews filled to bulging at the seams. An usher at the door gave Mrs Emergent and myself a bulletin as we entered but did not say anything. He was talking to two gentlemen in suits, one wearing a CIA-like headset, which made them look like bouncers. The pew was all wood with no cushion but was fairly comfortable. There was ample legroom. The lighting was dim, and there was a buzz as people chatted softly prior to the start of the service. (No one in my section seemed to know one another, though.) About five minutes before the start, some soft organ music could be heard. "Please take a moment to silence all cell phones at this time." The first words of the actual service were: "In the name of the Father, and of the Son, and of the Holy Spirit." A printed bulletin was all most people seemed to use, although there was a book called Worship: A Hymnal & Service Book for Roman Catholics in the pews. Organ, which projected well in the space. Babies were crying and fussing through most of the first reading and the parents didn't seem to want to take them out. Despite the cell phone announcement, a phone went off during the homily. The people we shared a pew with brought the kneeler down too quickly and banged my shins. The worship was very choreographed and stiff-upper-lip, but with a warmth to it. There were two choirs, one all male and one mixed, at each end of the cathedral, and a legion of almost 20 acolytes, all with assigned spots and well-planned duties. At one point there was a laying on of hands ceremony for baptismal candidates. The candidates circled the altar. Someone stood behind each of them and placed his or her hand on their shoulder. Then the priest went around and laid hands on each candidate. 7  Father Ryan's tone was warm and his words were well paced, but I'd say his sermon was more at the academic end of the spectrum. Faith is more pilgrimage than possession. God's ways differ from our ways. The only hymn sung by the congregation was at the close, but it was sung with feeling. The hundreds of voices really brought out God's presence for me. I also really liked the laying on of hands service; it was a very beautiful ceremony and a real life representation of the process of being brought into the community of believers. The constant shuffling of the congregation with the number of late arrivals. Also, the bulletin was not well written – it did not include many of the prayers, nor did it give references to page numbers in the service book. People who hadn't been to church for a while or who were not quite up on all their prayers might find it confusing. As for me, it really made me self-conscious about my worship. I should think it would be an easy thing to make it more inclusive. The cathedral was just too big to even be noticed looking lost. I stood around for a bit but no one approached me, so I proceeded to coffee hour which had been announced before the dismissal. Coffee was served in a large gymnasium, where cafeteria tables had been set out. The coffee was good, served in glass cups. There were also some delicious fresh muffins. No one talked to us – everyone seemed to chat just with their friends. This is expected, though, as the congregation was just too big for us to think we'd be noticed. 6  I felt like it was a bit too anonymous for me. I wouldn't be noticed in 25 years if this were my regular church. The service was beautiful, though, and the priest seemed very nice. The laying on of hands really gave a sense that there was very much a community of believers supporting those wishing to be baptized. Yes, I really felt God's presence with the two choirs and the laying on of hands. The laying on of hands ceremony.